The abundant and high quality groundwater at Mt. Fuji has been used for daily living and agriculture since ancient times by the people who lived nearby. In more recent years, it plays a major role in the industrial development of paper manufacture, chemicals and electronic equipment. Because of its large volume, stable temperature, and relatively small amount of included components, this water is considered optimal for daily life and industry. On the west side, it is also used for trout farming. In addition, Mt. Fuji's springs are precious oases not only for people but for plants and animals as well. Recently, this valuable groundwater has been contaminated and is growing scarcer. We must use it properly to protect this precious resource. Shiraito Falls, selected as one of Japan's Hundred Most Beautiful Views, is a waterfall that flows from the end of Mt. Fuji's Shiraito lava steam to the Shiba River. Composed of several hundred waterfalls that resemble white strings, it is 20 meters high and 200 meters wide. Since long ago, many poets have attempted to express its beauty. It is thought that approximately 2.2 billion tons of rain and snow fall annually at Mt. Fuji. Along with evapotranspiration, that equals almost 4.5 million tons of groundwater are stored each day. Over a long period of time, water soaks through the ground through the multi-layered lava gaps, becoming clean spring and well water that enriches our lives. Wakutama Pond and Shiraito Falls in Fujinomiya City and Kohama Pond and Kakita River at Mishima Springs are good examples of this. 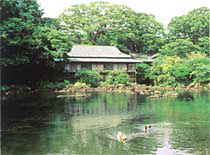 Kohama Pond is one of the spring pounds at Rakujuen Park, which is in front of Mishima Station. It is surrounded by beautiful Japanese gardens and comes from the end of the Mt. Fuji Mishima lava stream. Called "Mishima Springs," it is close to Susenen and Komoike. Unfortunately, Kohama Pond's spring water has been decreasing every year and the lava surface at the bottom of pond is now visible. "Kohama Pond filled with water"
Wakutama Pond wells like jewels from the lava in the Fujisan-Hongu-Sengen-Taisha Shrine premises and is designated as a National Natural Treasure. Kakita River boasts the largest water volume in Japan and, as the recipient of Mt. Fuji's natural bounty, lives up to its name as one of "selected one hundred exquisite waters of Japan." Approximately 1.2 million tons of groundwater well each day from the several dozen large and small spring mouths. This clear spring water is a vital resource and provides drinking water for 350,000 local inhabitants.